The Sony a7 & a9 series full frame mirrorless cameras are more and more popular these days. Many people have bought their Sony full frame mirrorless cameras. So if you are planning to shoot sports photography, wildlife photography, a telephoto zoom lens is required. Today we are showing you best telephoto zoom lenses for Sony Alpha full frame mirrorless cameras. Currently, there are not so much telephoto zoom lenses for Sony full frame mirrorless cameras, but Sony is confirmed to release more telephoto zoom lenses next, and also third part lens companies are plan to release more telephoto zoom lenses. If you are looking for a telephoto zoom lens with high image quality, the GM zoom lenses are your best choices. The FE 70-200mm f/2.8 GM OSS lens (Amazon/B&H/Adorama) is not only the sharpest and best low-light zoom lens for Sony full frame mirrorless cameras, it also outperforms many FE-mount prime lens options. The FE 100-400mm f/4.5-5.6 GM OSS lens (Amazon/B&H/Adorama) is stands out not only for its seismic shift in sharpness, but also for being not much different in size to the FE 70-200mm F2.8. Best of all, perhaps, is that for once there’s a tele-zoom that offers seriously impressive image quality, and also the weight of this FE 100-400mm GM lens is light than Canon version. 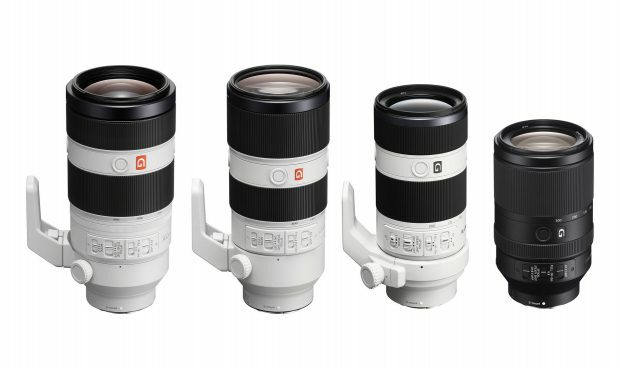 If you are looking for a light weight telephoto zoom lens for your Sony full frame mirrorless, both FE 70-200mm f/4 G OSS lens (Amazon/B&H/Adorama) and FE 70-300mm f/4.5-5.6 G OSS lens (Amazon/B&H/Adorama) are your best choices. FE 70-200mm f/4 G OSS lens has good value without compromising on quality or practical features. FE 70-300mm G OSS lens has good sharpness at the longer focal lengths, this lens is nonetheless a welcome and attractive addition to the lineup.